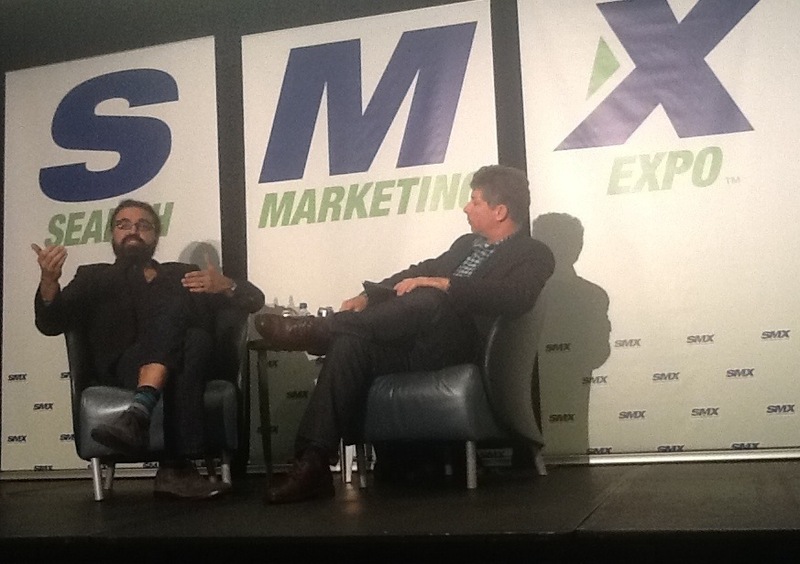 During this morning’s SMX Advanced 2013 keynote address, we’ll be hearing from Bing’s Corporate VP, Information Platform & Experience, Gurdeep Singh Pall. A look at the conference agenda explains where we’re going, the territory beyond 10 blue links and Bing’s vision for the future of search, plus where they’re putting their R&D efforts. Danny Sullivan is our moderator. Gurdeep would like to share a facet of Bing we may not be familiar with. Search over the last decade has been driven by keywords. The idea of typing keywords into a search box is soon going to be outdated. 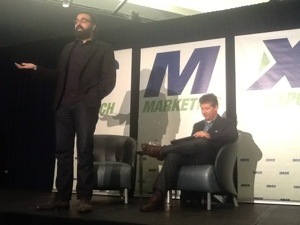 Proactive notifications and natural interaction with devices is going to be the new model and technology is catching up. There’s no reason that when you’re reading a web page you should have to leave to search. The keyboard and mouse are on their way out, to be replaced with conversational interfaces for apps and devices. Proactive agents informing and reminding will come from the overlap, like they can figure out what you want or are planning to do based on your searches and behaviors earlier in the day. Now they’re moving to convo format. In their research, kids exposed to tests using Bing in XBOX then tried to ask their microwave to Bing. Kids adapt to the new technology and have expectations of new ways to interact with the world around them. Siri is going to use Bing as the default search engine, a recently announced partnership. This partnership is just another one of many valuable partnerships. Danny mentions that along with Bing, Siri looks to a number of databases, including Microsoft’s. He asks if Bing’s exposure to a new audience through Siri will change anything? 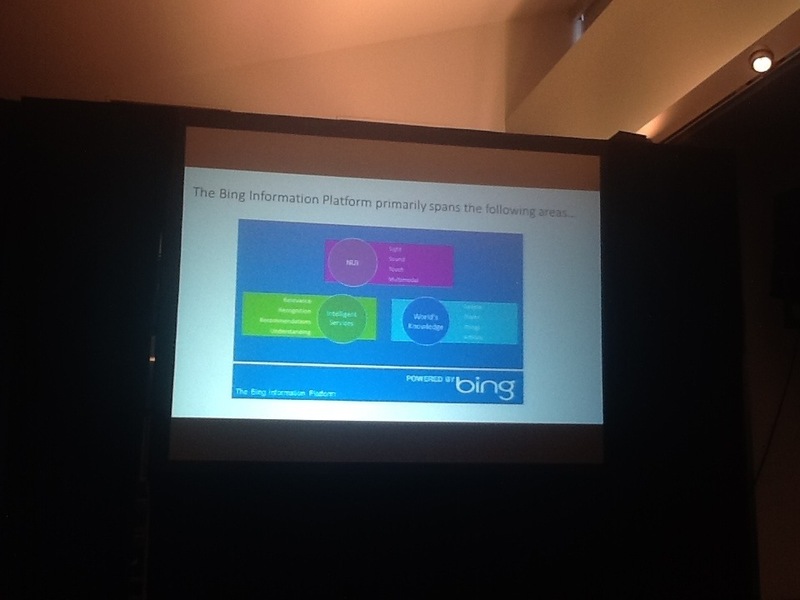 Gurdeep says that getting more user feedback through machine learning will make Bing smarter. Danny asks if Windows phones will get a Siri, like predictive search and more interactive stuff. Gurdeep can’t comment. Danny asks about challenges do you get from the different ways people search, like just a few words to a whole string of words, natural language in one device versus the way we search with text strings. Gurdeep says that we’ve trained people to fit into the constraints of technology, but when natural language is available, people will open up and adapt to all the possibilities. Danny asks if they find that younger people are using the language triggered Bing and Gurdeep confirms, saying the voice recognition in XBOX geared to younger voices. Danny asks if XBOX users are looking at Bing as a person. Gurdeep says law of attraction research is being done in the area. They’re asking users if they want Bing to be like a friend, like a butler, like a snarky concierge. There are lots of models and he believes they’ll eventually find lots of models available as options to choose your preference from. It’s like personalizing the color of your screen — an analog of the same problem. comScore figures have Bing at 17+% share of search this month — their best month ever. How do they drive user adoption? Gurdeep says that watching the inching up of their share of the market has been wonderful. With a respectable share of search they can pivot and use their assets. The growth is due to education, letting people know about the rich experience Bing is about. That leads to ah ha moments and people realize they can change their habits. The other key has been being there, at the right place when people want them. The tablet interaction, phone interaction, XBOX interaction are all different models and there’s an adaptation that has to happen for the device. Q&A time. Whats the evolution of ads look like? Gurdeep says that ads that show up in a highly contextual manner, and that different actions will be embedded, and they will be helpful and value add in the right place. The approach to how ads are surfaced will be more sophisticated, and they’re not rushing to put ads in the experience because it will be a natural fit to be the best experience. With the way Windows 8 works, do you recommend websites moving horizontally rather than up and down? He thinks it feels more natural to users and is a direction the technology will move toward. Do you recommend anything to content creators and webmasters with the direction of natural language search and cross-device differences? He says they’re not in a position to make recommendations yet. Bing Glass keeps Virginia hip. Should people move toward long-form Meta data to match new semantic search? It becomes matching of info available and what user is specifying and there’s a lot of tricks search is doing to extract intent. The best thing you can do is use Schema.org and structured markup. One more note about Bing. Last night’s SMX Advanced After Dark party was sponsored by Bing and was a roaring fun time at the Seattle Aquarium. And look at my souvenir! I call these Bing Glass. They’re so analog they don’t actually do anything! 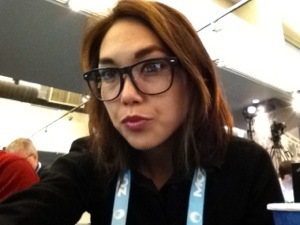 How’s that for an alternative to Google Glass? Virginia you really did a great job, Nice Presentation.